This category includes a variety of Signal Generators as it is difficult to differentiate between all the different types such as fixed frequency, sweep, pulse, data, as many products can achieve a mixture of functions. Frequency also varies from dc, to audio, video, rf and microwave, with or without am, fm or pulse modulation, etc. The Thandar TG101 200kHz Function Generator provides sine, square and triangle waveforms from 0.5Hz to 200kHz. There is a sweep input and 2 outputs: TTL square wave; and main output variable from 0mV to 11V at 600Ω with a dc offset of ±5.5V. See Thandar "Stack" for details. The Thandar TG105 5Hz - 5MHz Pulse Generator provides pulses of 200ns to 200ms period and 100ns to 100ms width. There is a gate/trigger input and 3 outputs: sync; TTL square wave; and main output variable from 100mV to 12V at 50Ω with +ve or -ve going pulses and single shot facility. The Black Star 1410 Video Monitor Tester generates a variety of video test signals with VGA and RGB outputs. See Black Star "Stack" for details. The Black Star Orion PAL TV & Video Pattern Generator generates a variety of television test signals with composite video and RF outputs. See Black Star "Stack" for details. The Kikusui KSG4100 FM-AM Signal Generator operates from a frequency of 100kHz to 110MHz with an output level of -19dBµV to 99dBµV. Various frequency and amplitude modulation levels can be set. 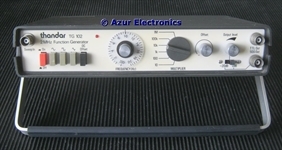 See Kikusui KSG 4100 FM-AM Signal Generator for details. 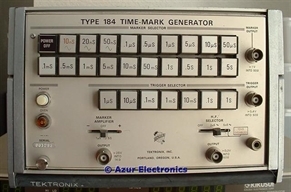 The Tektronix Type 184 Time-Mark Generator is intended for use as an oscilloscope calibrator but generates a useful range of signals. 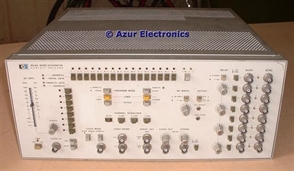 See Tektronix Type 184 Time-Mark Generator for details. The HP 3762A Data Generator is intended for use with 140Mbit/s PCM systems but can also generate a useful range of pulses. See HP 3762A Data Generator for details. 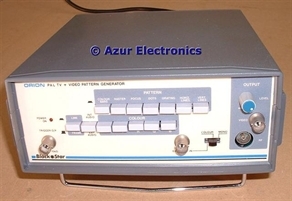 The HP 8016A Word Generator 9 channel data generator is capable of serialisation up to 256 bits with up to 50MHz clock. See HP 8016A Word Generator for details. The HP 8018A Serial Data Generator operates up to 50Mbits/s. See HP 8018A Serial Data Generator for details. The HP 8170A Logic Pattern Generator provides parallel 8 or 16 bit words with up to 2MHz clock. See HP 8170A Logic Pattern Generator for details. This has now been dismantled for spare parts, see HP 8170A Parts. The HP 8175A Digital Signal Generator provides 24 parallel data channels and 2 serial data channels at up to 50 or 100Mbit/s. See HP 8175A Digital Signal Generator for details. 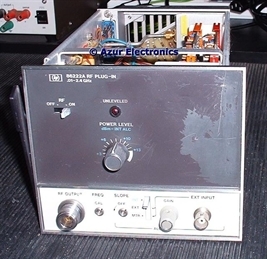 The HP 8443A Tracking Generator Counter operates over the frequency range 100kHz to 110MHz. See HP 8443A Tracking Generator Counter for details. 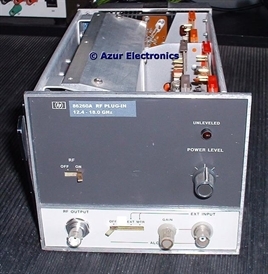 The HP 8444A Tracking Generator operates over the frequency range 500kHz to 1.3GHz. See HP 8444A Tracking Generator for details. 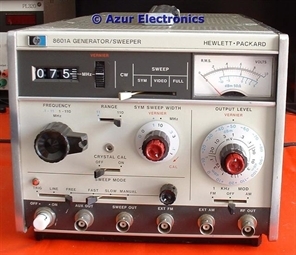 The HP 8601A Generator Sweeper operates over the frequency range 100kHz to 110MHz. It has a special VTO output that provides the RF output frequency plus 200MHz which is required by the 8407 Network Analyser. See HP 8601A Generator Sweeper for details. The HP 8620C Sweep Oscillator is a mainframe to control a variety of plug-in RF oscillators. See HP 86200 Series RF Plug-Ins for details. This can sweep the whole available frequency range, or part of the range, or operate at a fixed frequency. See HP 8620C Sweep Oscillator for details. The HP 8621A RF Section for the 8620C operates from 100MHz to 12.4GHz depending on the RF Module fitted. See HP 8621A RF Section for details. Some parts available, see HP 8621A Parts. 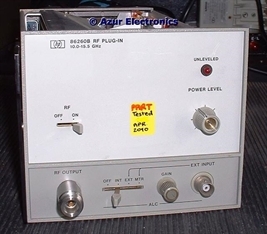 The HP 86220A RF Plug-In for the 8620C operates from 10MHz to 1.3GHz. See HP 86220A RF Plug-In for details. 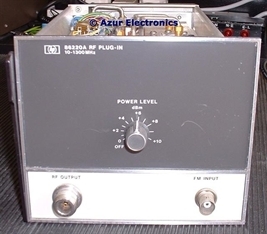 The HP 86222A RF Plug-In for the 8620C operates from 10MHz to 2.4GHz. See HP 86222A RF Plug-In for details. The HP 86260A RF Plug-In for the 8620C operates from 12.4GHz to 18GHz. See HP 86260A RF Plug-In for details. The HP 86260B RF Plug-In for the 8620C operates from 10.0GHz to 15.5GHz. See HP 86260B RF Plug-In for details. The HP 86290B RF Plug-In for the 8620C operates from 2GHz to 18.6GHz. See HP 86290B RF Plug-In for details. The HP 8657B Signal Generator provides a 100kHz to 2,060MHz output from +13dBm to -143.5dBm with FM, AM & Pulse Modulation. See HP 8657B Signal Generator for details. 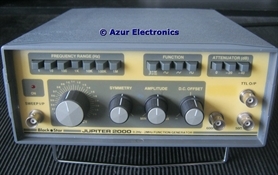 The HP 8657B Signal Generator has additionally Option 022 GMSK Modulation. See HP 8657B Signal Generator for details. The HP 8657D Signal Generator has a 100kHz to 1030Mhz output and additionally Option H12, H35 DQPSK Modulation. See HP 8657D Signal Generator for details. 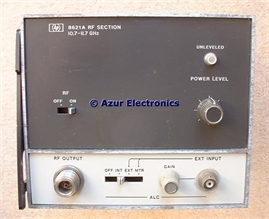 The HP 8922A GSM RF Test Set includes a RF Generator 10Mhz to 1000MHz and GMSK Modulation. 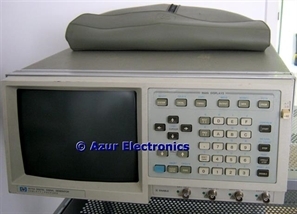 See HP 8922A GSM RF Test Set for details. Now Sold. The Philips PM 5715 Pulse Generator provides a versatile 1Hz to 50MHz output. 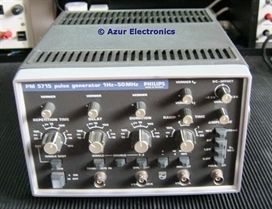 See Philips PM 5715 Pulse Generator for details. Now Sold. The Marconi 2019A is a RF Signal Generator providing 80kHz to 1040MHz output. See Marconi Instruments 2019A Signal Generator for details. Now Sold. 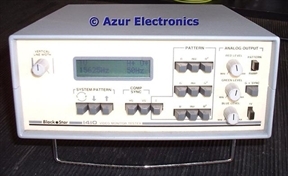 The Black Star Jupiter 2000 is a Function Generator providing 0.2Hz to 2MHz output. See Black Star "Stack" for details. 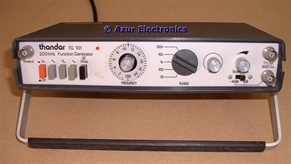 The Thandar TG102 is a Function Generator providing 0.2Hz to 2MHz output. See Thandar "Stack" for details. 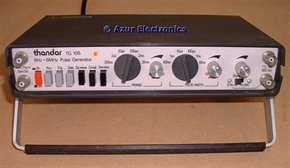 The HP 8082A Pulse Generator provides pulses up to 250MHz. 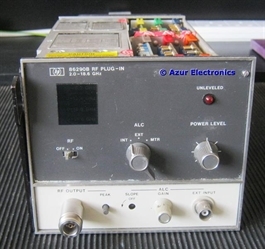 See HP 8082A Pulse Generator for details.